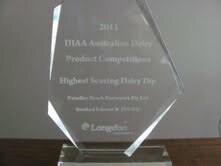 I am chuffed to bits to start my blogging life with the fantastic news that Paradise Beach Purveyor dips have won numerous awards at the DIAA "Awards of Excellence" Australian Dairy Product Competition 2011 . The award ceremony took place last night in Melbourne and I was so proud to walk up on stage and recieve the first ever "Highest Scoring Dairy Dip" Award for our classic Smoked Salmon & Dill Dip, after the DIAA found a new sponsor for the category- Langdon Ingredients. 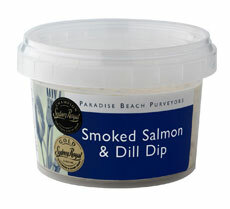 We also won Silver for the new Caramelised Onion Dip and the much-loved Tzatziki. I feel like a proud Dad after all the awards we recieved at the Sydney Royal Easter Show and now in Melbourne too. Quality ingredients are the core to the integrity of our dips and getting national recognition for that passion is really rewarding. Thrilled to bits. Steve.